Ok here is the thing. There are 3 things that you absolute must have if you want to succeed in making money online. Those three things are Money, Skill, Time. You absolutely must have at least one of these three things and quite honestly if you dont have at least one of them then the online industry just is not for you. Or at least it isn’t until you can get one of them. In an ideal world you would have ample amounts of all three of them. However having more of one can make up for having less of the other. In this article Ill go over each one. Why its important and how you can leverage having one to make up for not having the others. Money: Having money should be obvouse as money can over come any short coming in time or skill. Money can buy traffic. Money can buy programmers and writers to create products for you. Money can buy graphic designers and web developers to make your sales pages, JV pages and squeeze pages. With money you dont need to do anything since you can hire other people to do it for you. The simple fact is that money begets money. This is true for most industries and making money online is no exception. The unfortunate truth is that money is probably the most common thing that people are lacking. In fact for many people its the lack of money that is making them want to work online in the first place. I want to be totally clear. At some point you will 100% for sure need money. At some point you will need to hire a designer for a logo or a graphic. You will want to use some paid advertising to increase your traffic. Or you will want to by some software tools or other assets to help your business. The good thing though is that if you have time or skill you can use those two to make up for your initial lack of funds. Skill: While having money is the best of the three things to have skill comes in as a very close second. Why? Because with skill you can actually make money online right now very easy. If you have a marketable skill then you can start making money doing freelance work. There are tons of freelance sites out there such as elance, Guru, oDesk and many more that will let anyone with a marketable skill earn a side (or even a full time income) online. This is actually how I got started online. I worked as a freelance programmer and web developer. Doing this gave me two big advantages. First it allowed me to earn a second income which I could then use to build my IM business. It also allowed me to work with successful marketers which gave me some free training. While programming is the skill I had its important to note that programming is not the only skill that you can use to make money online. If you can write an article, make a video, do a tutorial, make a web page, do any kind of graphics design, or lots of other things, then you can try your hand at freelance working. In fact that alone can be your online business. If you choose you can do nothing but freelance and just run a freelance business. Despite what people say about it being competitive you for sure can make money like this. 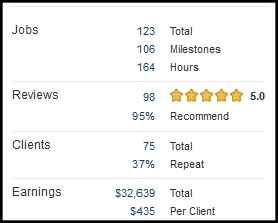 Here is a snap shot of what I earned as a freelance worker in 2012 from eLance alone (I was also working on other freelance sites as well at the time). The freelance marketplace is huge and provided you have a marketable skill you can always make money online. Also freelance work is a very freeing way to make your money. You can set you own hours. Work as much or as little as you want, and work from basically anywhere in the world. Once you build up a reputation and client base you can expand to other IM areas (like I did) or just keep freelance working. But of course as I have said you will need some skill that you can sell. Time: Time is the last thing that you will need. Its something that every single one of us has. Now some people will say they just dont have the time. But that’s not true. If you are truly devoted you can find the time. What can time get you? Well time can get you skill. I actually used time to get me my skill. You see I did not go to school for computer programming. In fact believe it or not (its 100% true though) before I started freelancing I was a carpenter. Yep a carpenter, as in makes things out of wood. I actually still play up on this fact in forums like the Warrior forum where I set my title to “digital carpenter”, this is a private joke and a reference to when I was an actual carpenter. How did I learn to code? Simple, I leveraged my time. I couldn’t quit my job because I didn’t have much money and I had a family to take care of so each night after the working, after supper, after all my obligations where done, when most people would relax, watch a move, drink a beer or whatever I was up in our spare room on the computer reading sites like tizag.com and learning how to program. I did this for over a year which worked out well because when I got laid off of my job I had a marketable skill to get into freelance working. Are you one of those people who think you have no time? Well so was I, but I found it and so can you. I had a full time job, a wife, and two kids and I still found time. Sure I had to make personal sacrifices I had no time for myself and it seemed like I was always on the go. But I was working for my future so it was worth it to me. With time you can learn a skill that you can then market or use to earn money. You can then use that money to increase your productivity (by hiring others). This allows will then allow you to earn more than you could on your own, which gives you freedom, flexibility and in the end more time for yourself. You just have to have the strength of will to put in the initial effort and think of the long run. Believe me it will be tough because initially you will see almost no reward. However if you have no money to start with and have no skill to start with, using what time you have is your only option. I hope you noticed that these three things that you need are actually circular in nature. Time = Skill = Money = more time/ more money, and on and on. If your one of the lucky few to have money from the start you can get going full blast in internet marketing quickly. If your a little better off than most people and have at least a skill you can at least make money as a freelance worker. If you have neither of these two things but are very devoted and disciplined then you can leverage your time to your advantage. If you have neither of these three things then there is about a 99.9% chance you will fail unfortunately. The good news is that a lack of time is something no one has. Its just a lack of motivation to use your time. It will be tough at first but believe me you, your business, and your future are worth it. *If you enjoyed this article please click one of the social share buttons on the left and help get it to someone else. It only takes a second and it just might bring you some good karma. Thanks Brett for todays post also who couldn’t use more time and more money! Nice article, good timing as I’m showing someone new to the biz what’s needed. I like your site makeover too and the new logo. I like this new look indeed, the other I could hardly read…Thanks! This is a premium theme from CodeCanyon that I customized.